Centaury As a relative of gentian is the centaury, as well as this, a strong bitter plant. Therefore, it also promotes digestion and stimulates the formation of digestive juices. Its digestive properties and strengthening related is so pronounced that the centaury is one of the most esteemed medicinal plants. That is already on his name more than clear. The centaury is since ancient times a very important medicinal plant, but it has become so rare that it is strictly protected. The main application of Centaury Plants the digestive weakness, especially of the stomach. Stomach pain and chronic gastritis are ideal for treatment with centaury. 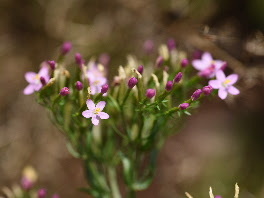 Due to its bitter substances the centaury strengthens digestion so strongly that it is the thousand florins that stuck in his name more than worth it. For bitterness of Centaury should be mentioned that it is really very bitter. His relationship to the Enzian here comes to full fruition. Although the Centaury appetite in weak, anorexic people, it helps overweight people against their overweight. This may be due in both cases to the strengthening of the digestive processes. Together with wormwood centaury can strengthen the pancreas in tea, so it can help against mild forms of diabetes. Centaury should not be used for stomach ulcers and duodenal ulcers. The tea is prepared as a cold extract, this can be 1/2 to 1 teaspoon to 1 cup of water centaury pull six to eight hours. Then seiht from the tea and warmed gently to drinking temperature. From Centaury tea you drink two cups a day before meals in small sips. In Mischtees can prepare the centaury as normal infusion, but then the effect is less effective. Centaury is very suitable in Mischtees. In the bitterness of tea blends such Centaury affects less intense. Alternatively, one can apply centaury also as a tincture, then you take 10 to 20 drops in a little water before your meals. For the tincture to a filled with fresh or dried herbs pieces. In poured 70% alcohol from the pharmacy, to the parts of herbs are completely covered. This approach lets you drag two to six weeks, then seiht you from the liquid and fill it in a dark bottle. Kept cold to such a tincture maintains at least one year. Frequently the centaury is also part of bitters. Outwardly the centaury is used less frequently. However, the folk medicine knows several external applications of Centaury. One can use the tea as washing, bath or for envelopes. Its fields of application are mainly festering wounds, eczema and lichen. Bach Flower Centaury Under the name of the Centaury is also used as Bach flower. It stands for the dedication to a task or to other people. Even in ancient times the centaury was a popular herb. The name "Centaurium" is perhaps not originally of one hundred times the gold that was initially suspected, but by a centaur Chiron names. This healed after his suppurating wounds legend with the centaury. This name origin is controversial. The famous doctors of antiquity as Hippocrates appreciated the very centaury. In the Middle Ages the word meaning the Hundred Guilder herb was then raised out of sheer enthusiasm and created the Tausenguldenkraut, in some places even the Milijöntusenkraut. The centaury plays an important role in many stories and legends. There is to bring health and great wealth. One of these legends also explains the name of the Tausengüldenkrautes in a new way. This story is about a rich man who was suffering from fever. He offered to poor people at a thousand guilders if they would free him from the fever. The poor gave the sick rich, the centaury and received after healing as promised thousand florins. "Seeing then that the centaury is seer bitter, kan easily have abnemen it on all scherpffe austrücknet and wermet. Zeeicht a little zusamen it this cause a wound herb is." 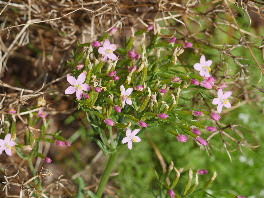 The centaury grows mainly on forest meadows, glades but also on semi-dry grasslands. There preferably calcareous, warm soil with a high clay content. However, the Tausengüldenkraut is not very picky with the ground, sometimes you will find it even on marshy ground. Nevertheless, the centaury is almost nowhere common. The centaury belongs to the family of the Gentian family, what you do not necessarily look it at first glance. Its bitter taste fits very well with the Gentian family. It is an annual or biennial plant that is 20 to 40 cm high. The Centaury has a four-sided stems, the sparrig-forgives himself from a certain height. The growth habit is somewhat reminiscent of the St. John's wort, which it is not related. It has to constantly sessile leaves, which are elongated and egg-shaped and has five parallel nerves. The pink-colored flowers bloom from June to August. They stand in a Trugdolde. The individual flowers are funnel-shaped. Each flower has five petals. A special feature is that the flowers open only when it is at least 20 degrees. Centaury With some providers you will receive seeds for centaury. This one sows from the February to May on the spot. The centaury needs poor soil, which is rather dry than too wet. It loves partial shade to sunny locations. Even with optimal location the centaury thrives not in any garden. It could be described as moody. However, if it feels good at one location, it does not need much care. The centaury centaury is our nature reserve and must therefore not be collected in the wild. Only plants that have been cultivated even in your own garden, you can reap. From July to August, the whole flowering herb is harvested. One cuts the plant from about five centimeters above the ground. Then binds to a few plants to loose bundles together and hanging them upside down in a dry, airy place in the shade to dry.